Why do I feel a bubbling sensation in my chest while sitting or lying down? 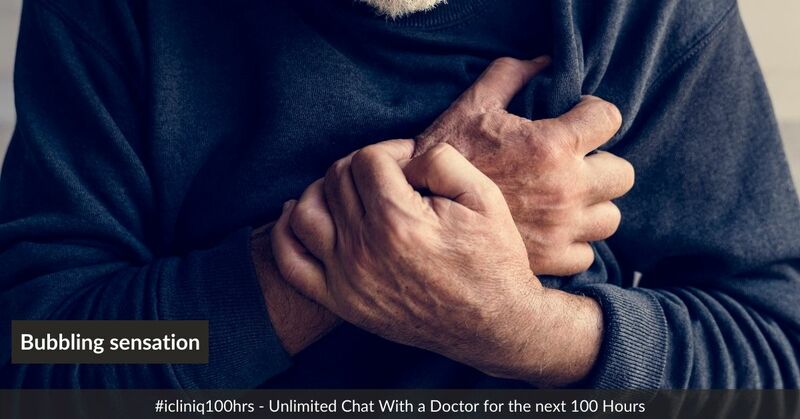 iCliniq › Ask a doctor online › Answers › Cardiology › Gastrointestinal Abnormality › Why do I feel a bubbling sensation in my chest while sitting or lying down? Q. Why do I feel a bubbling sensation in my chest while sitting or lying down? I am a 32 year old male, I have been to the ER twice in the past two weeks for a bubbling sensation that starts at the base of my sternum and goes up my esophagus, mostly when I am sitting or lying down. On the first visit they did a complete blood workup, EKG, and x-ray, everything was normal. They said it was GI related. I went back to the ER today because I had the same feeling. They took my vitals which were fine, and I had no pain when they pressed my stomach. I was prescribed Omeprazole 40 mg twice daily and Citalopram 20 mg once daily. Two weeks ago, when I was monitoring my neck pulse, I could not feel the pulse when I had the bubbling sensation. Once the feeling is gone, I can feel my pulse again. I am also under medication for anxiety disorder and acid reflux. What is wrong with me? • How can I treat the pain a little left under my Adam's apple? Did you have the same feeling during the ECG? Do you have any symptoms like dizziness, upper abdominal pain, nausea, vomiting, bloating and burping? The feeling that you are having may be due to acid reflux, but then you would have a burning feeling. There is a possibility of cardiac arrhythmias like atrial fibrillation or intermittent premature ventricular contractions (PVC). If you have symptoms on a daily basis, you should get Holter monitoring done. If all the cardiac tests are normal, then continue with the acid reflux treatment.